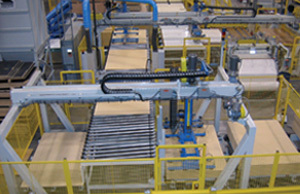 Fully Automatic Layup Lines for Wood Product Manufacturing – Creative Automation, Inc.
Creative Automation provides custom automatic layup solutions for hot and cold press lines. These systems are ideal for layup of doors, panels, etc. Layup and supporting material handling equipment is integrated with the customer's choice of press and other necessary processing equipment. 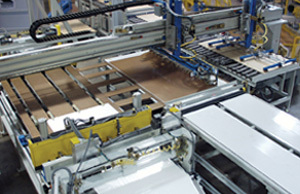 Following are examples of two layup lines, one for door production, the other for laminated panels (scroll down for Panel Layup Line). 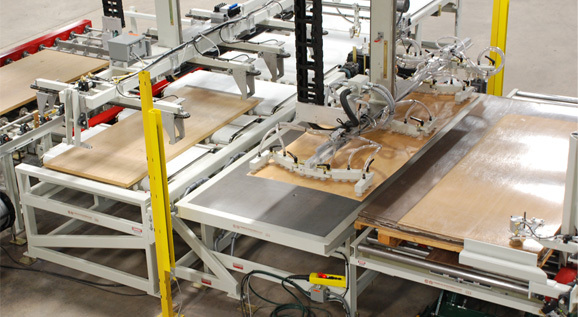 Creative Automation designed and built a full complement of automated material handling equipment to link the following processing equipment together: sander, panel cleaner, gluespreader, multi-opening hot press and double end tenoner. The system was designed to layup cores with veneer, laminate and crossbands at a rate of four doors per minute. Cores can be handled up to a maximum door weight of 750 lbs. Following are descriptions of select equipment in the line. 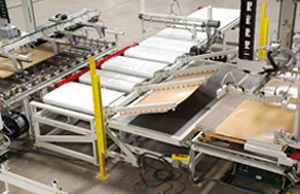 Servo-powered core feeder and sheet feeder carriages perform the layup operation. The core feeder can handle cores up to 750 lbs. The sheet feeder vacuum cups can be easily adjusted for any size laminate. 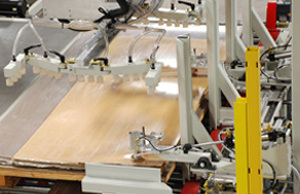 Each sheet of laminate is aligned automatically prior to being picked up by the sheet feeder. Each bottom sheet of laminate is automatically flipped over. 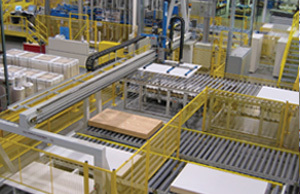 Creative Automation designed and built a full array of automated material handling equipment to integrate with a feed through hot press. The system was designed to layup cores with laminate coming in precut sheets or automatically cut from rolls. 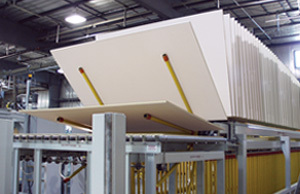 Laminate types handled were: melamine, polyester, phenolic and backers. Laid up cores were static charged to keep them aligned prior to pressing. Overall view of layup area in operation. Core feeding, panel cleaning and layup of laminate with cores. Closeup of layup area. Laminate can be in precut sheets or automatically cut from rolls. Finished panel stacking system in operation. Panels are automatically stacked based on grade assigned by the inspector.